The SADellite is a Photo Blog and in an orbit around me since the beginning of 2006. The name is a combination of "Sad" and "Satellite". It's order is to trace my life using photos. I hope there wont be only sad ones. This is a monument in the very heart of Nuremberg. Until a few weeks ago the little cobblestone hill underneath was inhabited by little kids crawling up and sliding down. Nowadays it's under siege by folks carrying Smartphones with battery packs. You're right, they play Pokemon Go. From this monument one can access several PokeStops and Arenas without moving. I am very curious how long it takes for the kids to claim their hill back. Maybe the re-conquering of the hill will be a Meta-Pokemon-Game: Kids try to catch human Pokemon players in a gamificated way. As a last notice: The name of the monument is "Narrenschiff" (Ship of Fools). Nomen est omen? One of the lesser known advantages for me of being a parent: You can use any swing without feeling guilty - as long as you have your little kid on your lap. I guess the advantage will go away soon though, as soon as the little one feels embarrassed by you. Any experiences you are willing to share? 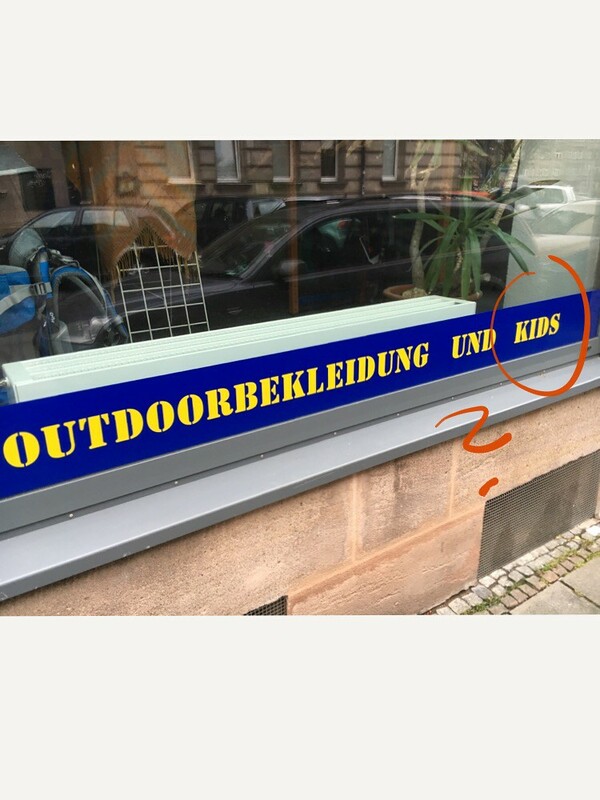 This shop seem to sell Outdoor clothing and kids. Seriously? 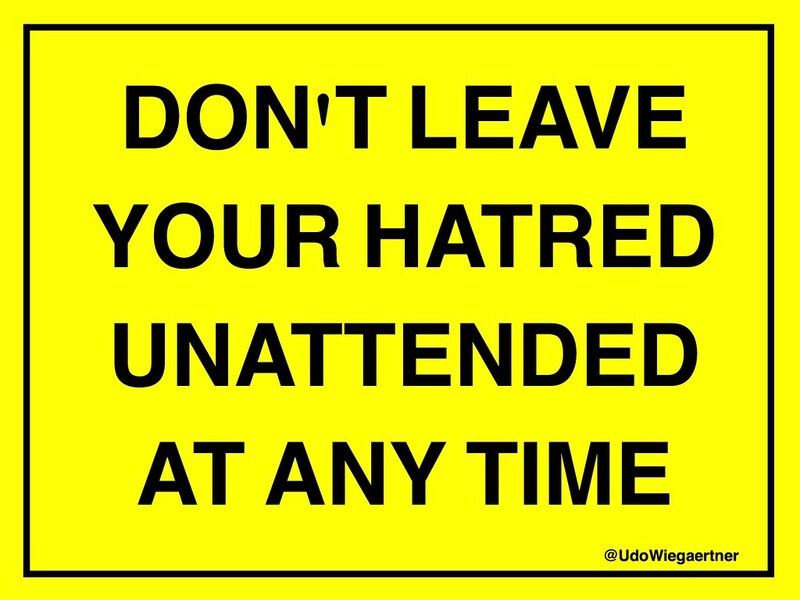 There seem to be a lot of hatred raging around these days. Sometime it looks like the anger isn't connected to a specific human being but completely unattended. If you feel some anger inside of you please be aware of it and don't let it grow beyond control. 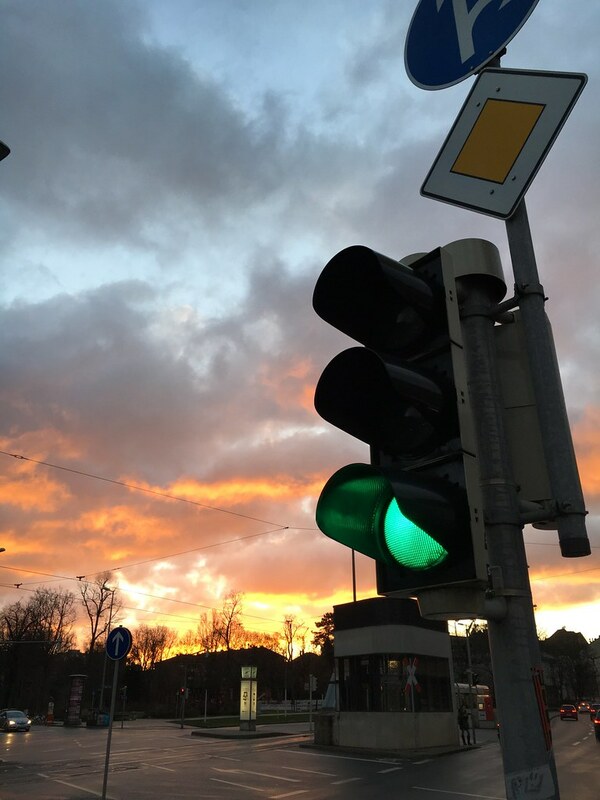 ...and all traffic at the junction stopped confused because red and green happened at the same time. This is how sunrises are supposed to be. 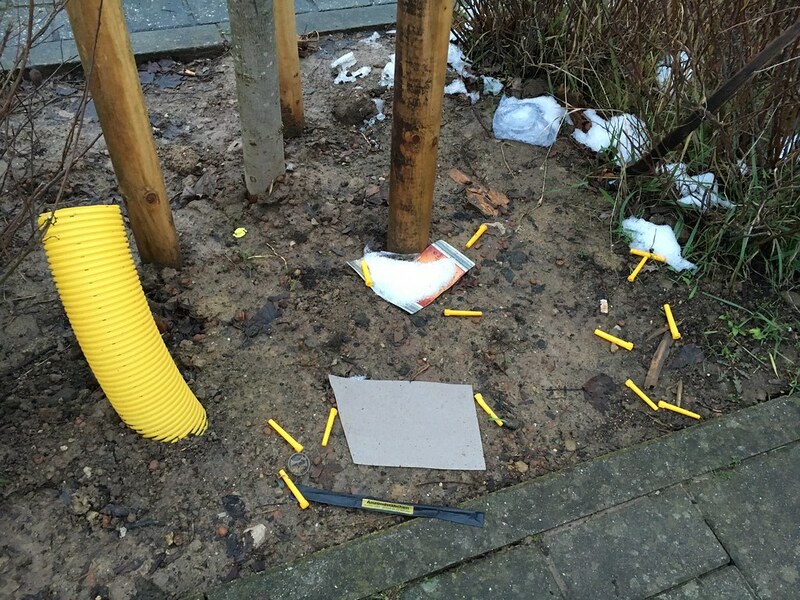 The yellow pipe had some yellow puppies. I spotted them in one of their first days out. 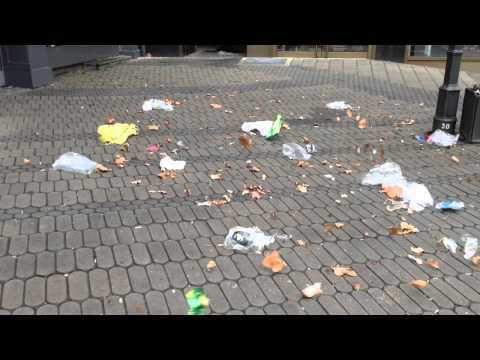 What I will keep from the big storm last week is a dance - a trash dance around a trash bin. The Christmas Market in Nuremberg is world famous. I am not sure why because there are dozends of other smaller markets around that are far less crowded and far more cozy. Visit the one in Nuremberg on a Sunday afternoon and you will feel like on a concert of Justin Bieber in the front rows (not that I really know how that feels). Sometimes one can even see people with small dogs or, even worse, with strollers making their way through the madness. Today I wanted to find out how a dog might feel in the middle of the X-Mas maniacs. So I took my small GoPro camera and mounted it on a monopod and held it 30cm above the ground during a walk across the market. Well, I am pretty glad that I am not a dog or a toddler but a 1.86m tall guy. Do your feet enjoy the summer breeze as much as this one does? I love to poke around in book stores and today I stumbled into something special. 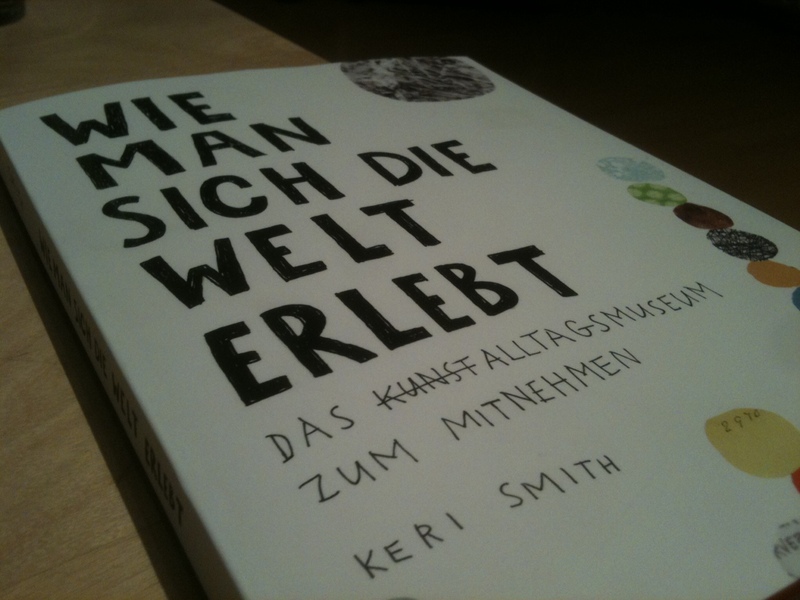 The book is called "Wie man sich die Welt erlebt" [Amazon.de] (the English version is called "How to be an Explorer of the World" [Amazon.com]) by Keri Smith. So what is so special about this book? Well, it simply felt like a braindump of my very own head. Do you know the feeling when you are listening to a person who is on the same wavelength? Do you know the urge to say "I also thought about the same thing recently" or "hey, I did this the other day"? Browsing through this book was very close to that feeling. It was almost ridiculous how close the chapters or tasks were to some of my photo walks (I call them "Digipirsches" - digital stalkings) or meandering thoughts. Over the last years a lot of more or less weird ideas crossed my mind. Some of them turned into something practical (like the 24 hour photo experiment) and a lot of them left my head a few minutes later and I forgot about them. The book flashed a huge pile of those thoughts and ideas back into my mind within seconds and I was super excited to remember all those things. Of course I bought the book and of course it will help me to wake up again the perception for the small things in life - a point of view that had suffered in the last months. On my way to the checkout the salesperson run (and I really mean "run") after me. I guess I was grinning a bit too broadly while browsing the book and she spotted that. She said "It is a brilliant book, isn't it? We got it just a few days ago". I replied "Oh yes, it is more than brilliant" and thought "You have no idea how brilliant, little lady". Well, I actually haven't told you what's actually IN the book. That's for YOU to find out during your next visit to your favorite book store. Keep me posted about whether the book inspired/reminded you at least a little bit as me. 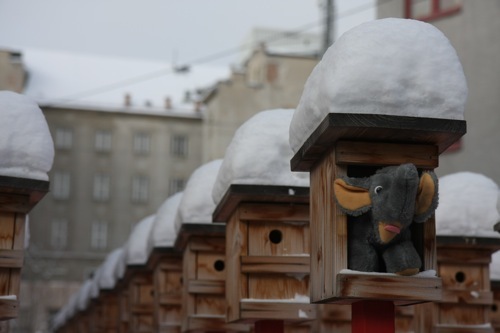 Vienna for just one day? Why not. My friend DD and I drove to Austria just for the sake of it. There was absolutely no plan what to do there and we enjoyed that fact very much. Well, DD hat some kind of rough idea because he brought a huge blue bag full of stuffed animals. He got the stuff for free from a Second Hand Store in Germany. He didn't know what to exactly do with them but throwing the bag into the trunk of my car was at least a start. He didn't tell me until arrival what's in the bag and when he showed the content to me in the morning in Vienna I was really excited. 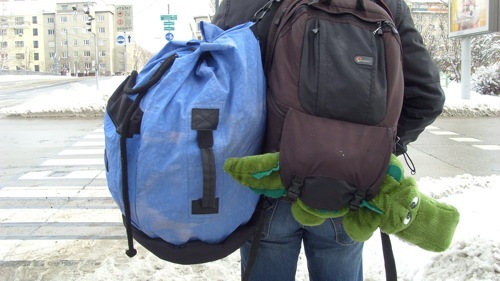 We decided to take the bag with us for our stroll through the city and see what happens. We didn't have to wait long for the first encounter because we were struggling with a ticket vending machine for the subway because it wasn't accepting our bill. A girl stepped by to help us (BTW: not so likely back home in grumpy Franconia). She bought the tickets for us using her own coins after telling us some strange plan that included the exchange of tickets, coins, change and some sort of magic. Neither DD nor I are very good at math and we forced them to explain her strategy again and again. I am really bad in things like that and I always envy people at the supermarket checkout that hand over a random amount of coins the get just one bill back. In the end we gave up trying to understand and just trusted her. It was kind of a defeat for us boys but the was really way more clever than we. Afterwards she just waved us good bye and walked away. DD and I just looked down at our blue bag, nodded and run after her. 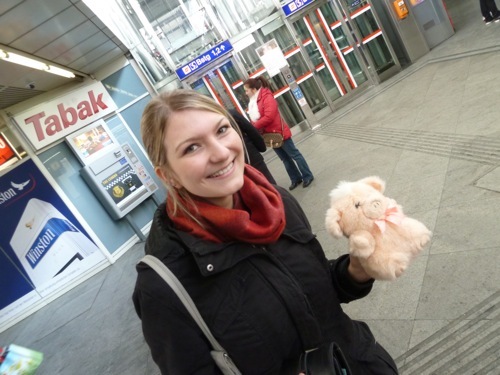 She chose a piglet, smiled broadly and disappeared. Good start. 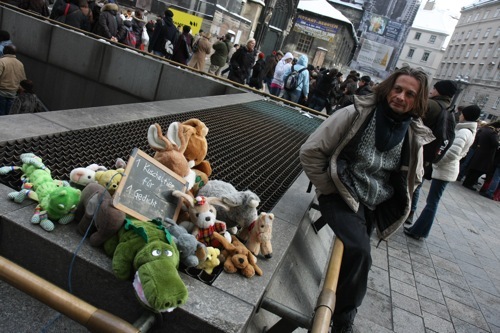 The Stephansdom cathedral is the center of Vienna and we thought about just giving the stuffed animals away to kids. After some discussion we came up with the idea to not give animals for free but to ask for a poem in exchange. 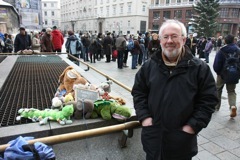 DD said that no one will recite a poem in public to get a useless stuffed animal. In the end we decided to invest exactly 15 minutes to find out. My old chalk board was perfect for advertising saying "1 stuffed animal for 1 poem". 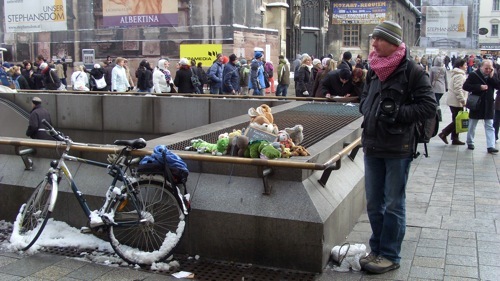 The pedestrian area in Vienna was full with street vendors so we didn't look like complete morons at the first glance - well, actually we did. After a few minutes a group of tourists walked by and we just stopped a family from Croatia and told them about our "mission". The liked our idea but only their youngest daughter was brave enough to recite a poem in Croatian. 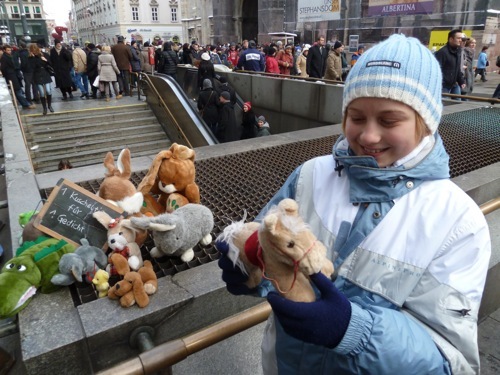 I think she was really proud and I am sure that she will handle her new stuffed horse well. An old man walked by, read our chalk board and smiled. 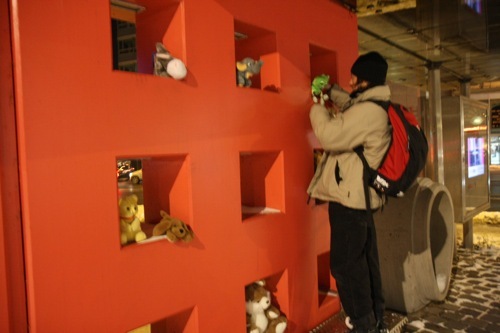 We: Excuse me, would you like to have a stuffed animal in exchange for a poem? Man: I don't know poems at all but I like your idea. We: Hey, you just looked like you already searched your mind for one. Right? Be honest. Man: Well, you are right. But I really don't know a single poem. We: What about if you go back to your childhood days? Man: Wait, I know a blessing for house owners. It rhymes. Does that count as a poem? 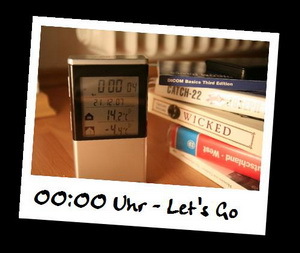 We: Hey, cool. We knew you know one. Thank you. What animal do you want? Man: I did it completely for free. Thank you for reminding me of the poem. In the end it was 3 poems in 15 minutes and some more interesting talks with strangers. 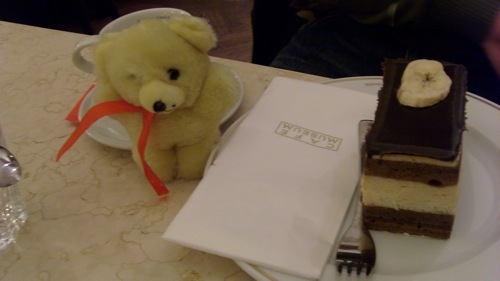 2008 I have been to Vienna for a business trip and we visited a nice little cafe. The waitress had every right to opt for an elephant for her good service. 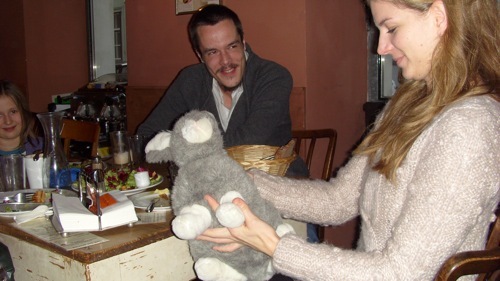 DD Gives an Animal to the Waitress of the "Cafe der Provinz"
While DD was dealing with the waitress I was talking to a group of people. A girl gave me a very nice poem for two stuffed mice (I promised not to publish the photo) and a blond grown up girl impressed her boyfriend by standing up and reciting some chapters of the classic "Der Erlkönig" from Goethe in front of all guests in the cafe. Really cool. The rest of the day was filled with a lot of kilometres walking around and in the afternoon I was really exhausted. 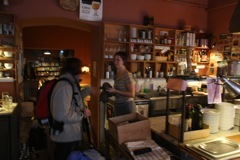 A Stopover in the famous "Cafe Museum"
In the end we still had approximately 20 animals left. Damn. After visiting the Secession building we sat them down for a public shooting and left a green worm. The highlight of the whole day was at the very end of it. 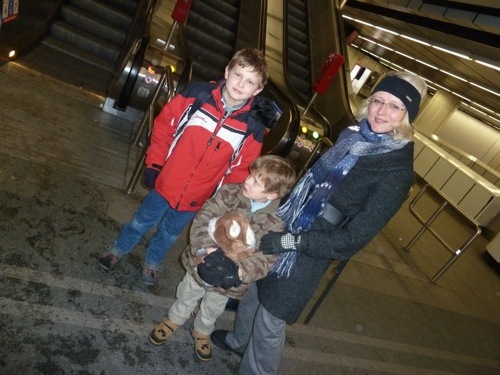 On our way back we saw a mother with her two sons in a subway station. One of the boys was crying very loud. DD and I followed them, stopped them and opened the blue bag in front of the crying boy. We told the mother that we just want to help healing the crying with a stuffed animal. Well, the open bag stopped the crying immediately. The little boy checked all the animals very carefully and took the biggest one. He didn't look exactly happy afterwards but at least he had some trust again in general justice in the world. Summary? Hmm, a lot of talks to strangers, some happy faces, much more openess than I expected, tired feet and a cool tour with a friend in a cool city. Vienna rocks. Don't ask me what happened to the rest of the stuffed animals. I guess they are living now in DD's apartment. It is a good day for stating slogans like the above. 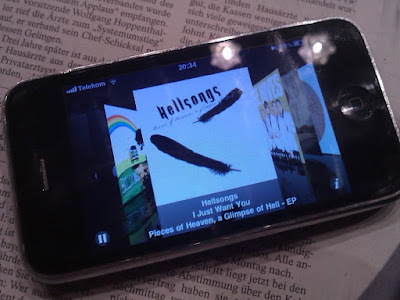 Although I am a fan of the old songs of Ozzy I prefer the version of Hellsongs a lot more. The line "There are no unrightable wrongs" is a tough one, isn't it? Exactly 3 years ago - on Dec. 21st 2007 my pal Daniel and I did our first 24 hour photo experiment. 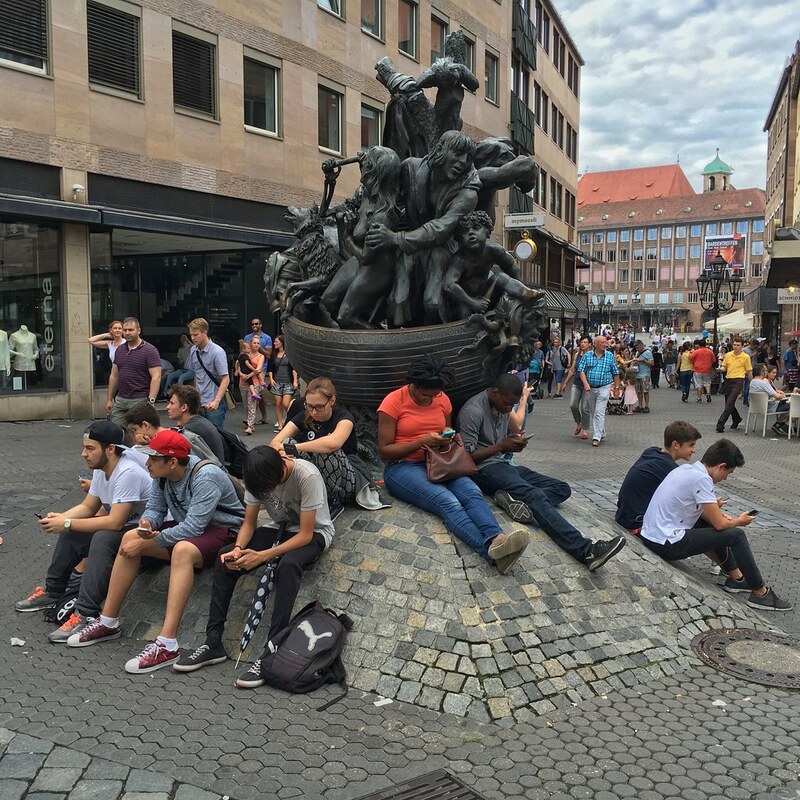 We strolled through the city of Nuremberg for 24 hours - from midnight to midnight. Our mission was to take random photos and see what happens and how many moments can fit into 24 hours if you try to live them intensely. 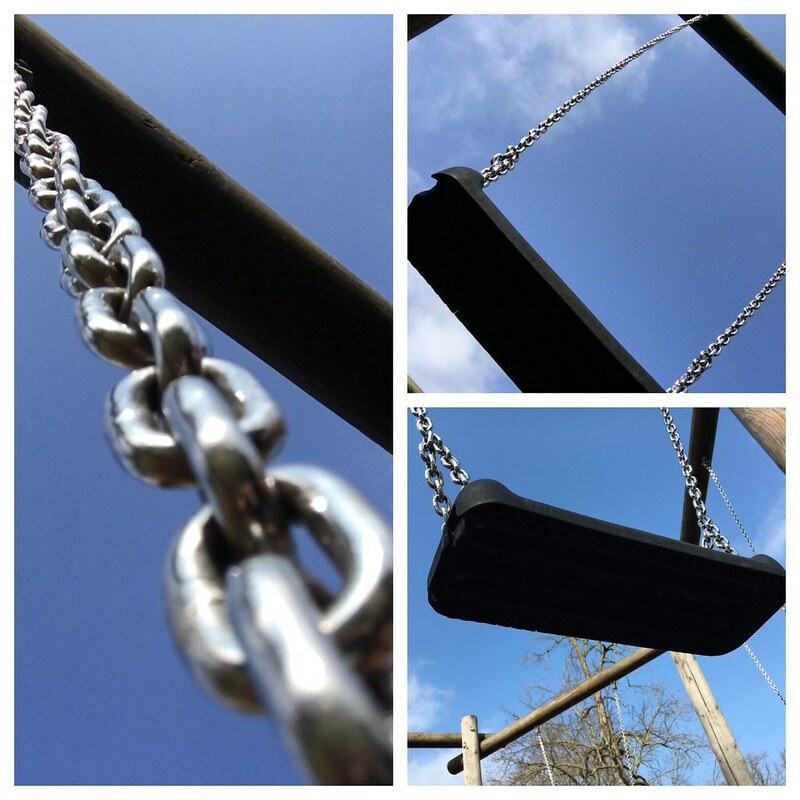 We created a little Web site with some of our photos and our thoughts from that day. Actually I don't want to bother you with old stuff but because I used the "anniversary" to browse through the page I thought I just re-share it with you. Yes, I know, all the texts are in German but I was too lazy translating all the stuff. Do we do a good job when it comes to integration of fellow citizens with roots stretching out beyond the borders of Germany? There's a lot of discussion around how to integrate migrants in Germany these days and I do have to admit that there are indeed some problems. My city Nuremberg is also the city of a lot of people from Turkey, Russia, Kosovo, Iraq, Greek and from a lot more places around the world. A good share of them isn't really able to integrate because they can't use the most useful tool to do so: The matching language. From my travels I know that language makes hell of a difference: It was so easy to connect to people in all the English speaking countries and a lot more challenging (up to almost impossible) in countries like Brazil or Jordan because I had no clue about Portuguese or Arabic at all. I know that I am living a very privileged life with access to education and a good income (don't mention the latter to my boss). Knowing that, I can imagine that it is almost impossible to learn German if you are e.g. a woman from Iraq who the father has taken out of school in fifth grade and who now lives in Nuremberg as an immigrant in a traditional Arabic family. My sister used to work as an elementary school teacher in Nuremberg and she told me that often the first-graders have to act as translators for their mums during parent-teacher conferences. 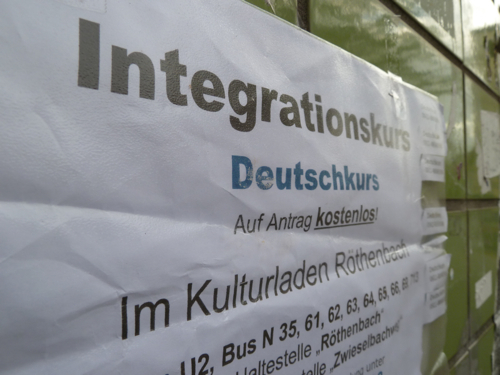 The German government recently made some effort to improve that situation by forcing immigrants into so called 'Integration Classes'. Such a class last more than 400 hours and the main part of it to learn German. Other subjects of the class include to learn about the rights (and duties) of being a citizen in Germany and how to deal with civil service in a bureaucratic country like Germany. All the learning lead to a feared 'Naturalisation Test' which caused a lot of discussion recently because the questions were considered either too lame or incredibly hard. A few days ago I did the test online just for the sake of it and found the multiple choice questions quite reasonable. What happened in Germany on November 9th, 1938? What is allowed during elections in Germany? I don't know whether immigrants would be kicked out of Germany after failing the exam but I don't wanna know how many non-immigrant 'old school' Germans would fail the test miserably. You can try the test for free [here...]. 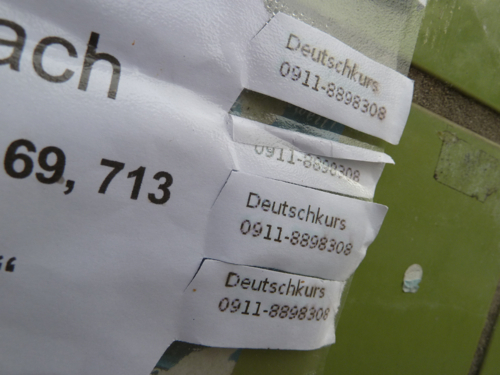 Oh, I almost forgot about the inspiration for this posting: I saw a flyer for a German class preparing for the Naturalisation Test. I really don't think it is a clever way to advertise a class for learing German in German language, is it? PS: Just for the record: I passed the test with 33 correct answers out of 33. Therefore I won't be kicked out. PPS: It would be great to hear how YOUR country helps immigrants.